Following his tremendous start to life at AS Monaco, Gelson Martins will definitely be feeling a palpable sense of vindication that he made the right decision to leave Atletico Madrid in January. Although he’s only joined on loan until the end of the season, and is expected to return to Atletico for next season, it’s been great to see him back playing at a level resembling his best. Gaining some vital minutes and confidence after his struggles to impress Diego Simeone at Atleti, where he only scored one goal in his 12 appearances, he’s relishing his opportunities at Monaco. With the tough taskmaster, Simeone, reportedly unhappy with his defensive output, in combination with the fierce competition for places, moving to Ligue 1 made sense for Martins. Hitting the ground running since his arrival, he’s thriving under newly installed manager, Leonardo Jardim, who’s returned to the club after replacing Thierry Henry. The scorer of three goals and provider of three assists already, he’s made a decisive contribution in all but one of the six matches he’s featured in. The 23-year-old’s influence has extended far beyond these tangible figures, however, for he’s added plenty of offensive impetus with his technical skills, incisive movement and all-round dynamism. Full of flair, unpredictability and excitement, Martins’ mesmerising dribbling has given Monaco another dimension going forward. On top of using his crisp first touch and sharp ball control, his vast repertoire of moves, including stepovers, feints, shimmies and shoulder drops, has seen him wreak havoc in 1v1 duels. La Liga Player Analyses: Santi Cazorla. Sergio Reguilon. His capacity to use wicked changes of pace and direction has also enhanced his threat, for he moves at such high speed, making it difficult for his opponents to react fast enough to stop him, in a similar way to why Arjen Robben is so effective. The fact he keeps the ball under control nicely when sprinting has served him especially well in transition, where he’s disrupted backlines when charging at them when they are unset and backpedaling. Extra keys to his success in this regard is how he regularly receives possession with his head up and in ideal body postures, so he can assess whatever situation he’s confronted with and make a more informed decision. Indeed, giving himself that vital split second of extra time is key towards him knowing where his teammates, opposition and exploitable spaces are in relation to him. The blisteringly quick winger’s off the ball movement has also been of a high standard, for he mixes things up well to unbalance his foes. Showing how well he can time and angle his runs in behind, this, in combination with his immense speed, has seen him frequently provide a deep threat. Adept at instigating his runs on the blindside of his man or in the gaps between defenders, he’s been a tough customer to keep tabs on. Whether hugging the touchline, where he can receive and be isolated vs. his man, or venturing infield, where he can connect with his fellow attackers, make space for his fullback or surge in behind, his variations only amplify his menace. Interestingly, if he’s not being used, his presence regularly pins or draws one or more markers towards him, which can importantly bring about numerical superiorities, free up others or open passing lanes. Stretching, causing marking dilemmas and frequently asking questions of his adversaries’ stopping structures, he does a fine job of stretching backlines both vertically and horizontally while keeping them on edge at all times. An adept, ambitious passer to boot, Martins loves unlocking backlines with his array of intricate flicks, backheels, through balls and dinks too. By the numbers, his 2.4 shots per game, 0.34 XG pg, 2.40 dribbles pg, 5.82 touches in box pg, 2.05 shot assists pg and 2.05 progressive runs pg, plus the fact he’s completing 86.3% of his 44.83 attempted passes pg and 92.9% of his 4.79 attempted passes pg into final third, suitably accentuate his quality. Although it’s still early days for him with the Monagasques, it’s been refreshing to see him gaining some much needed game time and demonstrating what a fantastic player he undoubtedly is. Not only has this move been brilliant for him on a personal level, it’s been invaluable to Monaco too, who were reeling and looking like prime candidates for relegation. “I knew the club and certain players that are here, and that’s helped me integrate. The situation of the club is an additional source of motivation for me. I came with a lot of desire to help the team and I hope we can win our next matches to get out of this position,” he recently insisted. With both he and his club’s prospects now on an upward trajectory, Martins’ scintillating form is proving to Atletico that he’s well worth giving a second chance next season. 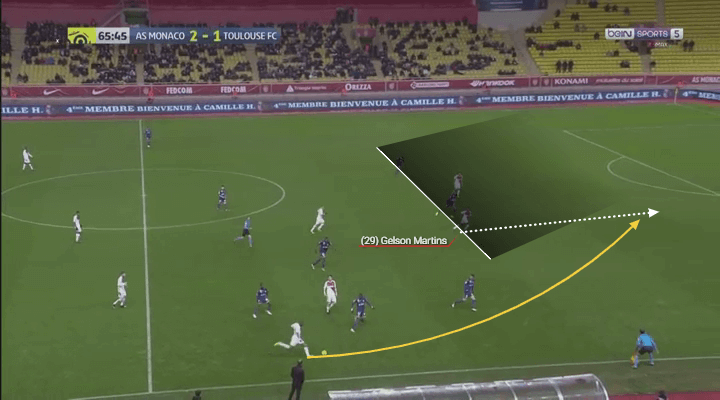 How will Gelson Martins’ season end for AS Monaco? Discover an easy way to bet with the best prices and massive limits, check out our hassle-free Skype Betting at custserve01 today or visit VOdds now!